Susana and her partner José went to great lengths to ensure that her son, Taiel, could have access to ongoing rehabilitative care. The couple has seen their share of heartbreak. They lost their first son in 2008 shortly after his birth. “Two years later, and after many tears, we sought to set aside our fears and try to have another child. Within us we felt a great deal of love that we felt we wanted and needed to give,” she writes. During the pregnancy, Susana went through all of the examinations and tests advised by their gynaecologist. However, when Taiel was born, they were informed that he had bilateral cleft lip and palate. Then, José’s cousin, Rosana, who lived in Tucumán, sent word that she had seen a poster at a Primary Care Health Centre for a foundation that cared for children with cleft. She had passed on the phone number to José. While they were initially hesitant about calling, because Fundación Gavina is located in Tucumán, more than 300 km away from Salta, their hometown, they called and were told a bit over the phone. They were then invited to visit the center. The family saved up money and headed to Tucumán, where they visited Fundación Gavina and met the staff, who examined Taiel. “I can’t describe the patience with which they listened to and answered our questions, the way the specialists knew how to fill the vacuum in our knowledge, and the way they treated us. We felt welcome,” she says. “We weren’t aware that cleft lip and palate required treatment prior to and following surgeries, as we had been given practically no information in Salta,” she says. Susana describes the anxiety which creeped in because they needed to ensure long term care for Taiel. “We felt an obligation to be good parents and get the best for Taiel, but we didn’t have the resources to stay in Tucumán; our savings weren’t enough to pay rent as well as expenses needed to support a baby,” Susana explains. They decided, however, that they needed to stay in Tucumán and start a new life near Fundación Gavina. That path, however, was not without its obstacles as their family was hesitant to support their decision at first. However, a few weeks later, José found a job, they moved out of Rosana’s house and Taiel continued with his treatment at Fundación Gavina. When he was 14 months old, Taiel underwent multiple surgeries on his lip and cleft at the Eva Perón Santiago del Estero Hospital. Parallel to his surgeries, Taiel also worked with a speech pathologist. 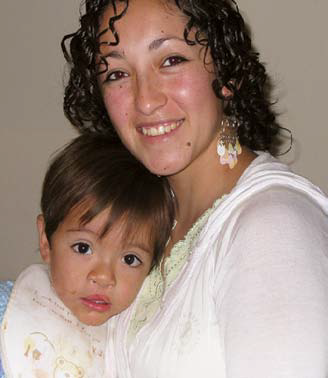 Sensing Susana’s commitment to the cause, Transforming Faces hired her on a part-time basis at Fundación Gavina as the parental group co-ordinator and dedicates the rest of her time to caring for Taiel. She visits maternity wards and helps guide new mothers with feedings. Our team is studying the resources in Northern Argentina to determine the need for project expansion. “In my view, Gavina is not just a Foundation where I bring my son; they are part of my life, they have seen us grow as parents and have given Taiel the opportunity to be part of their excellent work…The chance to help other parents to avoid the lack of information, the internal strife, and the lack of options that we felt makes it feel as if everything that we went through was somehow worth it,” she says. “I know that others may not see it this way, but Fundación Gavina and Transforming Faces changed our lives, and I want to give back in some way, even if it’s just a small part of what you offered us,” Susana says.